SPERI’s latest brief presents the results from a new study by Dr Liam Stanley and Dr Todd Hartman that tested how annual tax summaries might impact upon public support for welfare and taxation. The results show that the Government’s presentation of public spending data in their annual tax summaries – with welfare listed as the top category – may lead to lower support for state spending, and could contribute to anti-welfare sentiments. 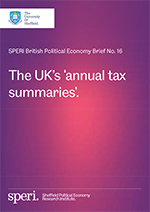 Download Brief No.16: The UK’s ‘annual tax summaries’. The annual documents, which provide individuals with a breakdown of how their Income Tax and National Insurance contributions are spent, attracted controversy when they were first issued in 2014. Tax spending was broken down across fifteen categories ranked by the amount spent on them, with welfare spending appearing as the top category. The Government was accused of manipulating welfare spending information in an attempt to stoke anti-benefits sentiment in the context of austerity cuts. Liam Stanley and Todd Hartman created a new online polling study to test different ways of presenting tax summary data to assess the impact on public opinion. The study presented people alternative tax summaries, showing the same data in different way, before asking questions that tested their attitudes towards state spending and welfare. One alternative summary, created by the Institute for Fiscal Studies (IFS), provided a more detailed breakdown of welfare spending – keeping the other fourteen categories constant, but using official Government accounting frameworks to split the welfare category into four parts. On the IFS tax summary, the breakdown of welfare spending ensured that health became the largest category. The second alternative summary was created by tax campaigner Richard Murphy through his blog Tax Research UK, which proposed 25 different categories to illustrate how taxes are spent. In this summary, ‘specific non-employment benefits’ (such as housing benefit) became the largest category. Likely to guess that the Government spends more on welfare. Dr Liam Stanley said: “This month every UK income taxpayer will receive an annual tax summary in the post. Our study suggests that the Government’s tax summaries could lower public support for state spending and contribute to concerns about high public spending on welfare and the stigmatisation of welfare benefit recipients. “These findings are significant because next week the Chancellor’s Autumn Statement will announce further deep public spending cuts. As the tax credits debate demonstrates the Government’s continuing commitment to austerity is increasingly controversial. In this context it is arguable that the tax summaries could help the Government to maintain public support for cuts to public spending and to the welfare budget.